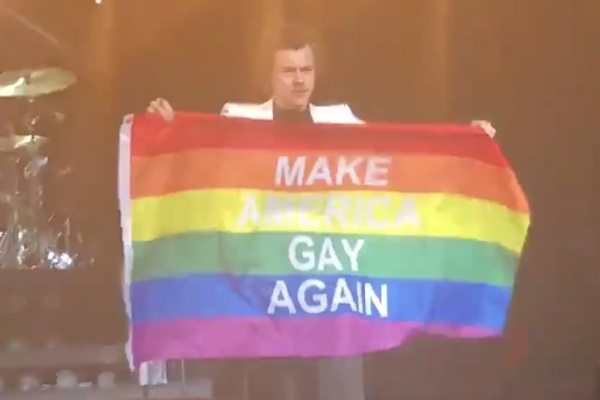 Harry Styles showed his support for the LGBT community yet again during his final concert stop in Inglewood, Calif.
Styles is known for supporting the LGBT community at his concerts. He has brought the Pride flag on stage numerous times. At another recent concert in San Jose, Calif., he helped a fan come out to her mother. Styles asked for the name of the fan’s mother and then shouted: “Tina, she’s gay!” The fan recorded the moment and showed it to her mother as part of her coming out. The former One Direction member has also caused fan speculation about his own sexuality. On his song “Medicine,” Styles sings “The boys and the girls are here, I mess around with them, and I’m OK with it.” The song has been hailed a “bisexual anthem” by some fans.